The ACT is an important part of the college application process. The score you receive on this test can have a significant impact on the quality of college you can attend. With this in mind, it is important to understand how the test is scored and what your score means. There are four sections on the ACT – English, Mathematics, Reading, and Science. After you have taken all four tests, you receive a raw score based on how many questions were answered correctly. The raw score is then converted into your scaled score by means of a conversion chart, as seen below. The average of your four scaled scores is your final composite score, which is the number the colleges you apply to will look at. Science – a raw score of 26 equals a scaled score of 24. Add the scaled scores together and divide by four: 23 + 30 + 27 + 24 = 104; 104 / 4 = 26. Therefore, the final composite score for this hypothetical student is a 26. If the final composite score is a decimal (for example: 20 + 33 + 21 + 17 = 91; 91 / 4 = 22.75) then the score is rounded up or down to the nearest whole number. In this case, 22.75 would become 23. The sections of the ACT are divided into subsections, which are scored separately but do not have any effect on your raw or scaled scores. These subsections basically split the main sections into smaller, more specific types of questions. The English section is split into Usage/Mechanics and Rhetorical Skills, the Mathematics section is split into Pre-Algebra/Elementary Algebra, Intermediate Algebra/Coordinate Geometry and Plane Geometry/Trigonometry, and the Reading section is split into Social Studies/Natural Sciences and Arts/Literature. The Science section does not have any subsections. However, starting in September of 2016, the subscores will no longer be reported or tracked, and new Readiness Ranges and Benchmarks will be introduced. One of these is the STEM Readiness Benchmark, which is based off of the scores you receive on the Mathematics and Science sections of the ACT and helps to determine your readiness for STEM field degrees and careers. Some colleges require the ACT plus Writing test, which is the standard ACT with the addition of an essay question. The essay is scored separately by two reviewers and the score is combined with your English and Reading scores to get your English/Language Arts score. Taking the essay portion of the ACT does not change or affect your English and Reading scores. ACT Raw Score: The number of questions you answered correctly in the section regardless of incorrect or blank answers. 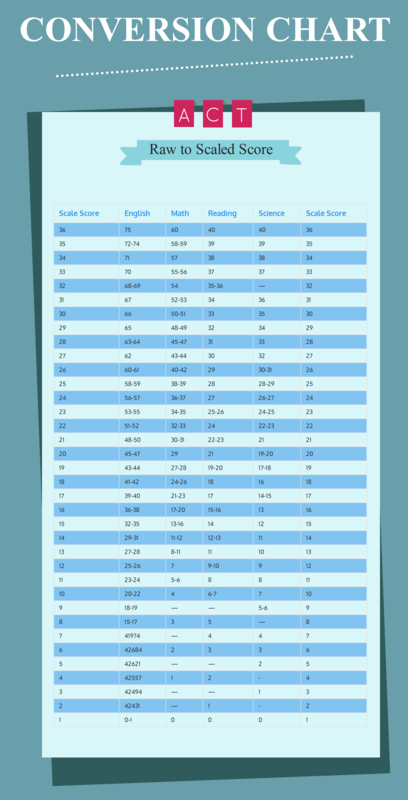 ACT Scaled Score: The score that you get on each section of the ACT after your raw score is scaled by using the conversion chart for the specific test you took. ACT Composite Score: The average of your four scaled scores. The highest possible score is 36. Conversion (or Scaling) Chart: Chart that is specific to each test and shows what your scaled score is based on your raw score. College Readiness Benchmarks: These are scores that represent “the level of achievement required for students to have a 50% chance of obtaining a B or higher or about a 75% chance of obtaining a C or higher in corresponding credit-bearing first-year college courses.” For the English test, the benchmark is 16; for Mathematics and Reading it is 22, and for Science it is 23.